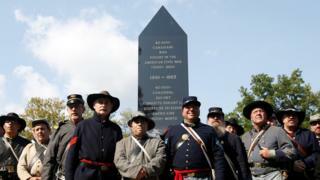 Canada has unveiled its first monument to the US Civil War, honouring the 40,000 Canadians who fought during America's bloodiest conflict. The monument in Cornwall, Ontario, was championed by a Civil War re-enactment group who raised almost almost C$44,000 ($36,000, £27,000) to build it. About 7,000 Canadians died in the war, which claimed almost 620,000 US lives. Although Canada was part of Britain until 1867 and officially neutral, Canadians fought on both sides. The pressures of the 1861-65 Civil War, and the threat of an American invasion, helped urge Canada to its own confederation and independence. "No one can fully understand Canada without appreciating that the war was an essential factor in the country's birth," wrote historian John Boyko in his 2013 book Blood and Daring. "We owe it to ourselves to understand the Civil War - to heed its whispering ghosts." The US Civil War was fought when 11 Southern states revolted against the US government and formed their own Confederate States of America. While some maintain the war was fought for "state's rights", most historians agree it was over slavery, which the South sought to preserve. 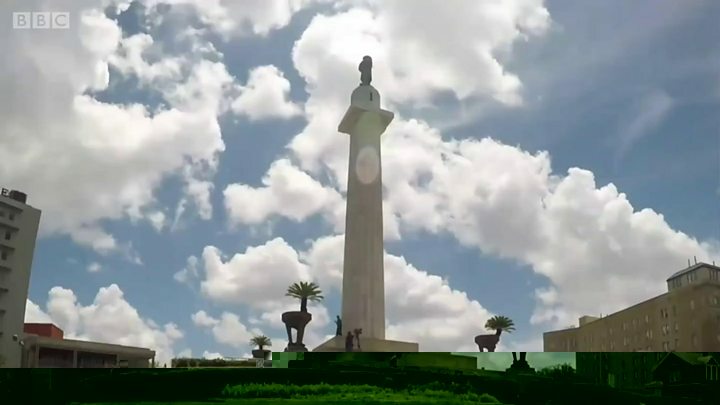 Although Confederate monuments in the US have been the subject of heated debate, supporters of the Ontario monument, which commemorates those who fought on both sides, say they are only interested in history. The monument was the pet project of a Montreal Civil War re-enactment society called the Grays and Blues. "We don't have any far-right maniacs, racists or anti-Semites, we're just town folks who are interested in history," Grays and Blues president Bob McLaughlin told Postmedia News. When the war broke out in 1861, Canada was still a subject of Great Britain and had maintained an uneasy peace with its American neighbours since the War of 1812, when Canadian and British troops marched on Washington DC and burned down the White House. Media captionWhy is the US divided over the statues? Many in the US government were fervent supporters of Manifest Destiny, an ideology that stated America should conquer the whole continent, and Canadians were worried about the possibility of a US invasion. Although most Canadians fought for the Union army, many were sympathetic to the Confederacy, with some Confederate fighters hiding out in Canadian cities to conduct border raids.